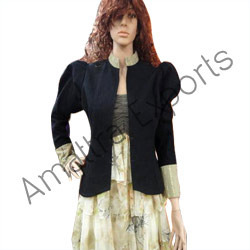 We are among the trusted manufacturer and exporter of excellent quality Women's Short Jackets. These women's short jackets are perfect to wear with any shirt or dress for that elegant and stylish clothing ensemble. Our women's short jackets have very attractive buttons and designed with attractive pockets. These women's short jackets have collars and long sleeves. Established in the year 2011, at NewDelhi (India), we, “Amattra Exports”, are ranked as the prominent name in the field of Manufacturing and Exporting a wide collection of Women's Wear, Kids Wear and High Fashion Jewelry etc. These are fabricated using the optimum quality fabric and sophisticated technology. Offered product range is designed with high precision in order to meet the set global standards. These are highly appreciated among our valuable clients due to their unique design, eye-catching look, excellent stitching and colorfastness. The offered range is available in variegated colors, styles, designs, sizes and patterns as per the varied requirements of clients. Our qualified quality inspectors keeps a vigilant eye right from raw material selection through the various stages of production to the shipment. In addition to this, we are offering these garments and jewelry to our esteemed clients at the most reasonable prices.